That's right! Fridays are now called Stamp-free Friday on the Paper Works Co. Blog. I think I had a small panic attack when Peggy told me I would be posting on Fridays in December and that this is what the theme would be! I'm definitely not used to making anything without stamps, but ended up having a lot of fun! I used some of my favorite holiday dp from Echo Park Paper Co. called Everybody Loves Christmas which you can find HERE at the PWCO store:) I used some fun Dew Drops to decorate my tree, and the sentiment comes from the journaling cards sheet found HERE. I cut my snowy hills out of white cs, and added some Stickles to the edges for some sparkle. To finish it off I added lots of stitching:) That was it! Very quick and simple! So do you have any fun weekend plans? Tonight we're going to go see some Florida snow which is basically soap bubbles being blown out of a fan LOL! Tomorrow night I'm going with my girlfriend to see Love and Other Drugs. Has anybody seen it? I think it looks really good! I'll be back tomorrow with my Really Reasonable Ribbon post and my first project using My Cute Stamps!!! I hope you have a great weekend and thank you so much for stopping by! This is darling! I love the tree! 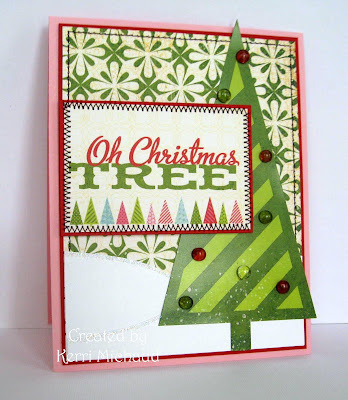 You can do any card even without stamping, Kerri! Because you are a very talented girl! Love it Kerri! You rock at color combinations! LOL - soap bubbles??? Yes, we get enough of the real stuff up here in CT! WHAT?!?! I don't know if I could pull off such a gorgeous card with no stamps! This is amazing girl!